Federer's serve: less extreme and a better model. Now in the next two articles we'll analyze the motion of another top player, a player with one of the most underrated serves in the game: Roger Federer. Federer is a great model for most players at most levels, much better in many respects than either Sampras or Roddick. In these articles we are going to use his motion to identify all the basic elements that go into building a high level technical service motion, a motion that will allow players to get the most out of their ability on a consistent basis. In our analysis of Pete and Andy we identified certain basic positions in their motions that are shared by all good servers. But other components, the ones that make their motions particularly distinctive, are more problematic for many if not most players to model. For Sampras these include his starting stance, his body rotation, and the extreme left ball position on his toss--all omponents that contribute to his heavy, high velocity ball, something we have quantified in terms of the spin rates. (Click Here) For Roddick the elements are more idiosyncratic: his supersonic abbreviated windup, his extreme suppination, and his use of both feet in the narrow stance. These are elements that are very difficult to model even by players at the highest levels. What makes Andy distinct makes him more difficult to model. Don't get me wrong, I feel it's important to analyze the motions of the great players--obviously, since I have spent so much time doing it. Understanding what is really happening is the only way to develop clear and accurate information. Coaches need to be knowledgeable about what is actually happening in the strokes to decide what their particular players are capable or incapable of attempting and to help them try. Some players will always be able to incorporate or partially incorporate advanced elements. But my observation is that, for the majority, including many players at very high levels, blindly trying to copy what makes players like Roddick and Sampras special can cause more harm than benefit. Just look around at any sectional junior tournament and see how many kids think they are using Roddick's abbreviated motion. If you put the video camera on them, you see reality is different. Their motions are usually technically inferior to the players with more conventional windups and stances. Roger Federer's motion is so smooth and effortless that it doesn't attract the same attention as Pete or Andy. What makes Federer less distinctive is probably what also makes him a better model. It's a simpler, more classical motion with fewer extreme elements. Roger's serve may not have the mph or be as dynamic looking as Andy Roddick's. It may not have as much topspin or be as unplayable as Pete's. But it would be hard to claim it isn't effective, and seemlessly integrated into his all court game. If you were to pick one service motion from the top players to use as a template for building or improving your serve, my opinion is that it should be Roger. So we'll take a look at his motion, element by element. In this first article we'll start with the grip, and the starting stance. 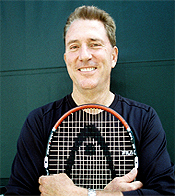 We'll also address the windup or backswing, the racket drop, and the path of the arm and racket to the ball. In the next article, we'll continue the analysis with Roger's toss, leg action, body rotation, and his followthrough and then talk about how to put all the elements together for yourself. Federer's serving grip: a mild eastern backhand. The key to understanding the stance is when both feet are on the court. Like all pro players, Federer uses some version of a backhand grip. You could call it a continental, or a mild eastern backhand. If we look at the position of his hand on the racket bevels, most of the palm of his hand is on the top bevel, or bevel 1. His index knuckle appears to be in the center of bevel 2. This grip works well for high level players, pro players, college players, ranked juniors, even some advanced club players. But you can develop the same basic swing elements with a slightly less extreme grip as well. You could call that less extreme grip a mild continental. The heel pad slides somewhat more to the right and is positioned somewhat less on bevel one and somewhat more on bevel two. The index knuckle slides somewhat to the right as well, to the edge between bevel 1 and bevel 2. This is an easier grip for lower level junior players and many adults. It worked pretty well at the pro level for John McEnroe as well. 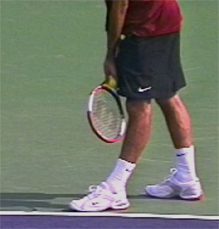 Federer starts with his weight forward on his front foot, standing up on his back toes. Then he rocks back and stands up as he starts his windup. That initial leaning position is not the key to understanding his stance. That a personal ritual, similar to the way Sampras started slightly hunched over, with his front toes up in the air. The real key is to see what happens as he starts his windup and stands up so that both feet are flat on the court. What we see at that point is that his front foot is at a slight angle to the baseline, a little less than parallel. This angle is a slightly more open in the deuce court compared to the ad. The rear foot is offset to the left of the front foot, with the toe of the back foot roughly in line with the heel of the front foot. The rear foot appears to be just about exactly parallel to the baseline in both courts. But in the ad court it's also set a few inches further back to Roger's left. At the start of the motion, Roger's racket and racket arm point basically straight ahead at the net. His tossing arm also points straight ahead with the ball resting roughly on the throat of the racket. Note also the angle of his shoulders. In the ad court they are a little bit shy of perpendicular to the net. In the deuce court they are open an increment further. This difference in the shoulder angle is analogous to the small differences in the angle of his front foot. Don't worry too much about the position down to the inch. Also, don't be fooled by the personal physical rituals players use at the start of the serve: Roger's rocking motion, etc. The players are all a little different. What matters is what happens when they start the motion. Every player eventually develops his own rituals. Rather than model Roger's rituals, it's better to model the elements in his stance first. To do this, position your feet, torso and racket at Federer's angles as described above, and just stand straight up and down with your weight more or less equally distributed between your feet. Your arm and racket should point more or less straight ahead. You can also start with less left to right offset between the front and rear foot. I like to position players with both feet paralel to the baseline with the heels lined up and the shoulders fully square to the net and let them evolve their stance from there. As you get comfortable with these elements, you'll develop a unique physical ritual of your own. Roger's windup: the longest and most circular next to Phillippousis. I love Roger Federer's wind up because, other than Mark Philippoussis, it's the longest and most circular of any of the top players. True, the abbreviated backswing is the overwhelmingly trendy motion. Andy Roddick set off that craze which has mesmerized and infatuated players, coaches and commentators. We saw in our Roddick articles that, at least for Andy, there probably is some technical advantage to it. As Rick Macci was the first to point out, it allows him--or forces him--to move in and out of the racket drop faster than any other player. (Click Here.) And that's a beautiful and fearsome thing. The question is whether it is remotely realistic for the average player. And I have an answer. No. So far Andy is the only player I've ever filmed that has made it work. The point of the windup is to position the racket at the full drop position so it can then travel upward to the ball on the right path and with the most speed. If the windup doesn't accomplish that, you're probably better off starting the motion with the racket already dropped behind you. Unfortunately this is exactly the case for many players who try to copy Roddick. They fail to make the basic drop position. Roger's drop--not as deep as Andy or Pete. It's absurd. A player decides that by modeling Andy's backswing he can get more racket head speed and it ends up creating the exact opposite effect. Trying to add an esoteric advanced element players sometimes destroy the more basic element they think they are trying to enhance. Watch Roger's arm and racket in the wind up. Rather than starting immediately upward like Andy, his arm and racket drop downward at the start of the motion, pointing directly down at the court. This is similar to Sampras who also drops his arm and racket downward so they point at the court. At this point in the motion, however, Sampras begins to abbreviate the backswsing, bending his elbow and starting to raise the racket from the shoulder. In contrast Roger keeps his arm straight and continues to move his hand backward and upward tracing a circular path. His arm stays straight longer and the tip of the racket doesn't point nearly as far to his right. W hen be begin to bend his elbow the motion still moves on a curve upward. As noted the only current player with a more circular path is Philippoussis, similar to the great John McEnroe in a previous generation.